The migration of starling flocks from north and east still goes on; usually only snow and the freezing of waters stops it. The starlings are incredible flyers and in ranking compete with swallows. In flight view the wings are triangular, the flight fast and straight. For information: a thousand kilometres as day migration trip is not rare for them in favourable weather. The autumn plumage is browner and the white flecks show already at a distance. 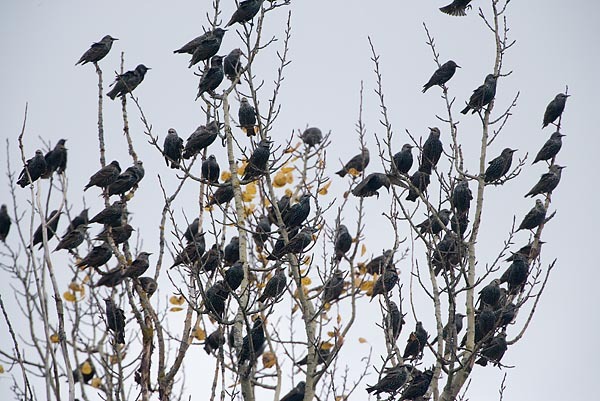 In meadows and pastures flocks of several hundred birds can be seen, sometimes even larger. Tree buds, berries still remaining on trees or apples left on fruit trees are used for food. For nights they gather in secure larger reed beds or in large trees at the edge of them.